WASHINGTON -- President Donald Trump has expressed reservations over calls to withhold further U.S. arms sales to Saudi Arabia as the U.S. looks into the fate of a Saudi writer missing and feared murdered by his own government. Mr. Trump said that taking such a significant move against the kingdom "would be hurting us." Decades of close U.S.-Saudi relations, which have only intensified under Mr. Trump, appeared in jeopardy by the suggestion of a carefully plotted murder of a government critic, Jamal Khashoggi, 59, who disappeared a week ago after entering a Saudi consulate in Turkey. The wealthy former government insider had been living in the U.S. in self-imposed exile. In an interview Wednesday with "Fox News Night," Mr. Trump said he wanted to find out what happened to Khashoggi but appeared reluctant to consider blocking arms sales, citing economic reasons. "I think that would be hurting us," Mr. Trump said. "We have jobs, we have a lot of things happening in this country. We have a country that's doing probably better economically than it's ever done before." On his first international trip as president, Mr. Trump visited Saudi Arabia and announced $110 billion in proposed arms sales. The administration also relies on Saudi support for its Middle East agenda to counter Iranian influence, fight extremism and support an expected peace plan between Israel and the Palestinians. More than 20 Republican and Democratic senators instructed Mr. Trump to order an investigation into Khashoggi's disappearance under legislation that authorizes imposition of sanctions for perpetrators of extrajudicial killings, torture or other gross human rights violations. As CBS News correspondent Holly Williams reports, a U.S. State Department spokesperson has denied the U.S. had any prior knowledge of a plot against Khashoggi. 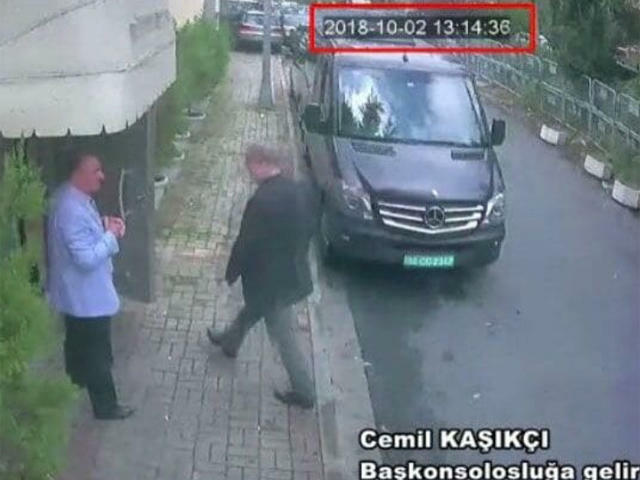 Nevertheless, the Post's report raises questions about what duty U.S. intelligence agencies may have had to warn Khashoggi that he was in danger, if they did know of a plot to capture him. A 2015 directive issued by the Director of National Intelligence mandated the U.S. intelligence community "to warn U.S. and non-U.S. persons of impending threats of intentional killing, serious bodily injury, or kidnapping." Turkish President Recep Tayyip Erdogan, meanwhile, increased his pressure on the Saudis over Khashoggi's disappearance, local media reported Thursday. Erdogan's comments appear aimed at slowly intensifying the criticism while balancing the need to maintain the kingdom's investments in Turkey and relations on other issues. Erdogan was quoted by Turkish media on Thursday as telling journalists flying with him back home from a visit to Hungary that "we cannot remain silent to such an incident." "How is it possible for a consulate, an embassy not to have security camera systems? Is it possible for the Saudi Arabian consulate where the incident occurred not to have camera systems?" Erdogan asked. "If a bird flew, if a mosquito appeared, these systems would catch them and (I believe) they (the Saudis) would have to most advanced of systems."